Gallia Academy senior Lane Pullins (28) celebrates with his teammates after scoring a third quarter touchdown against Meigs on Friday night in a Week 1 football contest at Memorial Field in Gallipolis, Ohio. Meigs junior Weston Baer eludes a pair of Gallia Academy defenders on Friday night in a Week 1 football contest at Memorial Field in Gallipolis, Ohio. GALLIPOLIS, Ohio — Streaks ended. 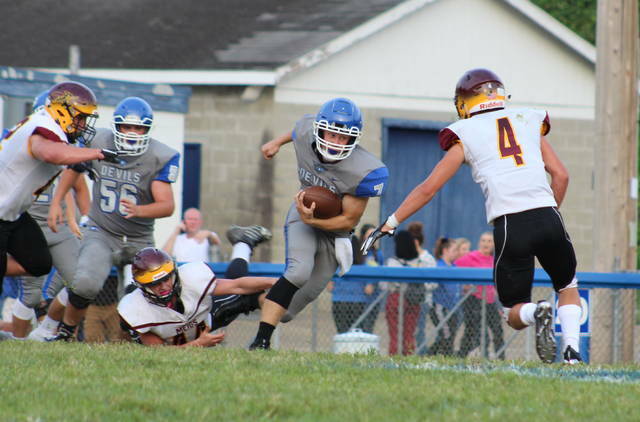 Gallia Academy snapped a two-game losing skid to Meigs and also won its first season opener since 2012 on Friday night during a 47-34 triumph over the Marauders in a Week 1 football contest at Memorial Field in the Old French City. The host Blue Devils (1-0) built a 20-12 halftime lead and took their largest advantage of the night four minutes into the second half as Lane Pullins plunged in from two yards out for a 27-12 cushion. The Marauders (0-1), however, answered with three of the next four touchdown drives in the third canto, allowing the guests to secure a slim 34-33 edge heading into the finale. The Blue and White put together a pair of lengthy drives that not only ate up clock down the stretch, but each drive also resulted in a touchdown that propelled the hosts back out to a two-possession advantage. 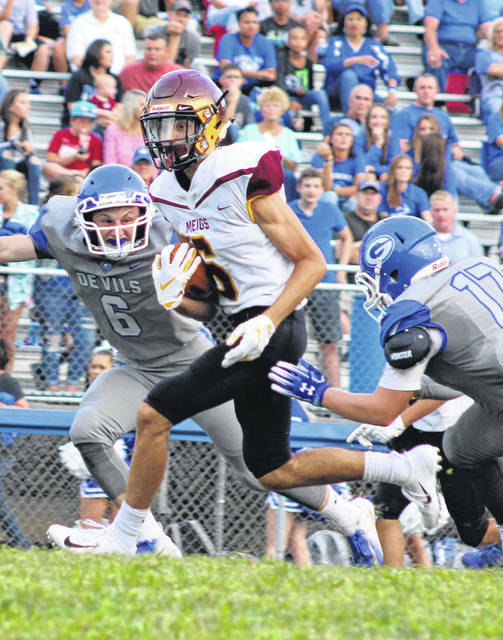 The Maroon and Gold ultimately ran out of downs on each of their ensuing drives, giving Gallia Academy the ball back with a 13-point lead and nine seconds left in regulation. The hosts followed by taking a knee to run out the clock, then headed down to the victory bell for its first August ringing in six seasons. 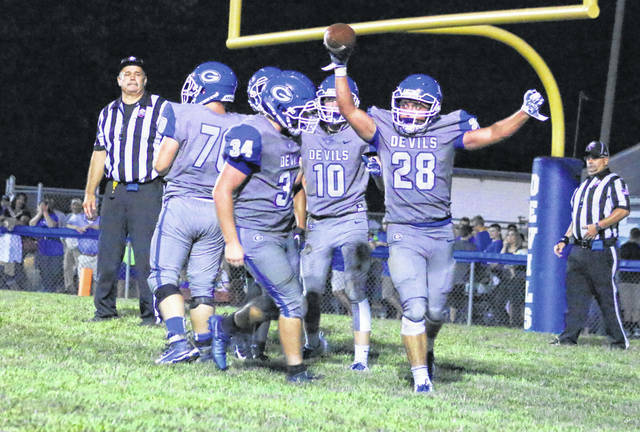 The Blue Devils put up 500 yards of total offense — including 335 rushing yards — while also claiming a 23-13 advantage in first downs. The Marauders, conversely, ran for just 86 yards and amassed 326 yards of total offense in the setback — although the guests were plus-1 in turnover differential. The key to the outcome, however, came down to Gallia Academy’s ability to produce during that pivotal finale — a period in which the hosts outgained Meigs by a sizable 117-59 margin in yardage. At the end of the night, second-year GAHS coach Alex Penrod believed that his troops — and their collective experience — proved to be a big factor in how the result came out. Given that his team is a bit on the young side this year, seventh-year MHS coach Mike Bartrum saw some positive things from his troops — most notably the amount of fight in them. After a scoreless first quarter, Meigs got on the board first as Landon Acree picked off a Justin McClelland screen pass and went untouched for 13 yards into the end zone — giving MHS a 6-0 edge with 8:26 left in the half. The Blue Devils answered with a seven-play, 41-yard drive that ended with a Pullins one-yard run at the 5:13 mark — allowing the hosts to take a 7-6 lead. GAHS forced a three-and-out, then needed only one play to cover 73 yards as James Armstrong hauled in a pass from McClelland and went untouched to the house — giving the hosts a 13-6 lead with 3:45 remaining until half. The Marauders answered with a six-play, 70-yard drive that was capped on an 11-yard pass to Acree from Coulter Cleland, making it a 13-12 contest with 31 seconds left. The Blue Devils went right back to Armstrong with their very first offensive snap, and the sophomore delivered after hauling in a McClelland pass and sprinting 66 yards to the house for a 20-12 lead with 17 seconds remaining before the half. After Pullins’ TD run with 8:32 left in the third made it a 27-12 contest, Meigs responded with an offensive flurry of its own. Zach Bartrum scampered 67 yards for a touchdown at the 8:13 mark for a 27-20 deficit, then Cole Adams hauled in a 56-yard scoring pass from Cleland to knot the game at 27 with 4:51 remaining. Jacob Campbell recaptured the lead for GAHS at the 2:24 mark as the senior capped a six-play, 48-yard drive with a six-yard run — making it a 33-27 contest. Meigs, however, answered right back with a six-play, 39-yard drive that ended with a 25-yard TD pass to Adams from Cleland — giving the guests their final lead of the night at 34-33 with 18 seconds left before the fourth stanza. Gallia Academy captured the lead for good at the 9:53 mark of the fourth as McClelland plunged in from five yards out, capping a seven-play, 55-yard drive for a 39-34 edge. Armstrong completed the scoring at the 1:21 mark with a 30-yard touchdown run that capped a nine-play, 74-yard drive that made it a 47-34 count. Gallia Academy was whistled for four penalties for 45 yards, while the guests were flagged eight times for 41 yards. The Blue Devils also had three of the four punts in the contest. Pullins led the GAHS rushing attack with 26 carries for 129 yards, followed by McClelland with 126 yards on 21 attempts. Campbell and Armstrong also respectively added 46 and 34 yards on the ground. McClelland was 5-of-7 passing for 155 yards, throwing one pick and two touchdowns. Armstrong led the wideouts with four catches for 145 yards and two scores. Zach Bartrum led MHS with 80 rushing yards on 10 attempts, followed by Abe Lundy with three totes for 10 yards. Cleland — a freshman playing in his first varsity contest — completed 16-of-30 passes for 240 yards, throwing three scores and zero interceptions. Weston Baer hauled in five passes for 30 yards, while Ty Bartrum grabbed four passes for 98 yards and Adams caught two passes for 81 yards. Both teams return to action Saturday as Gallia Academy hosts River Valley and Meigs travels to St. Clairsville for a pair of non-conference matchups.